Volunteers from Cummins company, Emcure, Rotary club of Kothrud and Baner, Fergusson college, Modern college, Wadia college, Huzurpaga school, Mastermind School, Symbiosis School of Economics along with several individual volunteers were part of the process. Despite heavy rain, wastepickers along with volunteers worked tirelessly late into the night to divert as much nirmalya as possible from the rivers. Every Ganapati Visarjan, tonnes of paper, plastic, thermocol, flowers, coconuts, fruits and cloth accompany thousands of Ganesh idols into Pune’s rivers. But for the past 6 years, SWaCH members (waste pickers) have been recovering organic and inorganic waste, and ensuring that it enters the recycling stream. Food waste including coconuts and fruits are given to them to either resell or distribute amongst family members. The remaining bio degradable nirmalya is transported to the different partnering agencies for further processing into compost. The Nirmalya Project started on a small scale six years back on just one or two ghats and with only a few waste pickers. After the SWaCH Cooperative was formed in 2008, however, the project became more structured and started partnering with NGOs, corporates, citizens’ groups and volunteers with the support of the Pune Municipal Corporation (PMC). This year Cummins and Emcure adopted 13 ghats in PMC and 2 ghats in Pimpri Chinchwad Municipal Corporation (PCMC) areas respectively. While corporates are encouraged to ‘adopt a ghat’, volunteers and waste pickers position themselves on the ghats for awareness creation and collection. Nirmalya collection has increased from 31 tonnes in 2010, to a massive 90 tonnes in 2012 to 97 tonnes in 2013. The Nirmalya Project’s success hinges largely on its participatory nature and the fact that it touches upon an issue that is of interest and concern to many – safeguarding the environment. Without requiring any special technical or knowledge skills, citizens can volunteer their time to achieve an easily quantifiable target – which gives a tremendous sense of satisfaction. 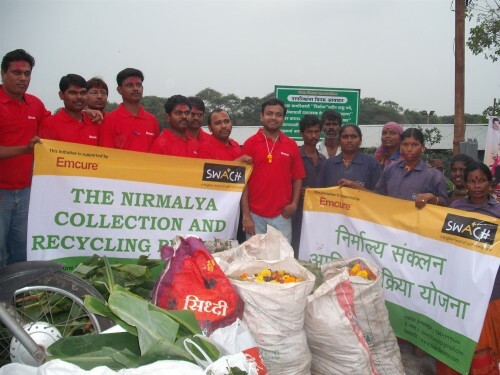 Corporates who have understood the Nirmalya Project and its potential, tend to view ‘adopting a ghat’ as a facet of their on-going CSR work. ‘Adopting a ghat’ involves both financial support and HR support (employees are encouraged to volunteer their time on the ghats and be personally involved in looking after their city’s natural resources). This year, the bio-degradable nirmalya has been sent to the following locations for composting: Kothrud Blind School, Dilasa School, Sangam World Centre, Aundh Ramp, SWaCH Office- Kothrud and Katraj Ramp.